It may still be November, but some of the schools I visit are already starting to practise their Christmas plays. 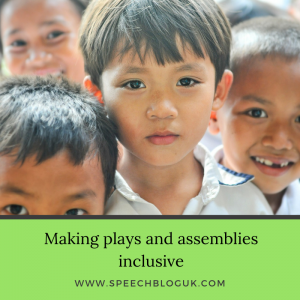 So I thought I would write about how to make plays and assemblies more accessible for children with speech and language difficulties. Every child should be included; you might juts have to think laterally about a few things! It can be easy to think that plays will just be too stressful for the child or that they can’t take part. However, with the right practise and support most children can take part in some shape or form. However, if it is really too stressful, talk to the child (if appropriate) or their family about what is best for them. For some children, getting them into and then getting them to stay in funny clothes maybe very hard. I will always remember one young man I worked with who was a sheep in the Christmas nativity play. He didn’t really like getting changed anyway and certainly not into a white fluffy sheep costume with a hood that covered his head. So we practised. We practised in class, we practised in the rehearsals and we even practised in speech therapy! We were practising body vocabulary so it tied in nicely. On the day, he got changed into the costume with minimal complaints, went on stage, performed his dance to his very proud parents and was then immediately allowed out of the hall and out of the sheep costume!! Practise really helps. If that just isn’t going to work, think about other clothes they could wear; if they are a sheep, could they just wear a white t-shirt from home? Otherwise is there a part that doesn’t require a specific costume? Can they just take off their school jumper? If the noise and singing and dancing and lights are just too much, can the child come in for their part and then be allowed to leave? They don’t have to sit squirming for the whole thing. If they can stay in, sit them near a known adult who can support/ sign/ use pictures to support the child to sit and follow the cues. Make sure they know where they will be sitting and where they have to move to. It might also help if they know where mum and dad are going to sit (if you can arrange this). Sometimes looking for loved ones can be too distracting. This also ties back in with my point about practising. Try and explain that on the day there will be lots of people in the audience. Try showing them pictures – you don’t want it to be a surprise on the day. Put yourself in their position. You know them well. Which things are likely to be tricky for the child? Try and predict and make appropriate changes. If the child has lines to say, make sure they have enough time to practise and almost over learn them. Can they have the words or a prompt card on stage? If not make sure there is an adult to prompt if they forget. When practising you could put symbols with the words to help them remember. Think carefully about the words: does it need all the tricky words or could you make the sentences simpler and not change the meaning? If you have a child with speech difficulties, make sure you aren’t asking them anything they really can’t say. Again, can you change a word to make it more achievable for them? I truly believe all children have the ability to amaze with the correct support. So before you rule them out of a part or the play all together, think about what you can change to make it achievable for them. I didn’t think that young man would remain in his sheep costume, remember the song and dance and join in with everyone – but he did. Happy nativities everyone!